The Ropery at Ropery Cottages in Whitby, Yorkshire sleeps 6 people. Ropery Cottages in Whitby are two stunning and luxurious properties which are set on the edge of East Cliff, overlooking the fishing town of Whitby and the famous iron bridge on the beautiful north Yorkshire coast. The Ropery (ref UK2441) is a real touch of luxury, with fantastic views from the hot tub, decking and from the living/dining room down over the River Esk as the estuary approaches the sea. All the bedrooms have a either an en-suite shower room or use of a bathroom with the luxury of 2 steam sauna cubicles and a lovely, relaxing corner bath. There is a fully fitted kitchen and spacious living area with 50” Smart TV and USB plug sockets in many rooms. Esk Cottage (ref UK2440 [Esk Cottage]) is a romantic, ground floor apartment with plenty of space to relax and make the most of all the home comforts. 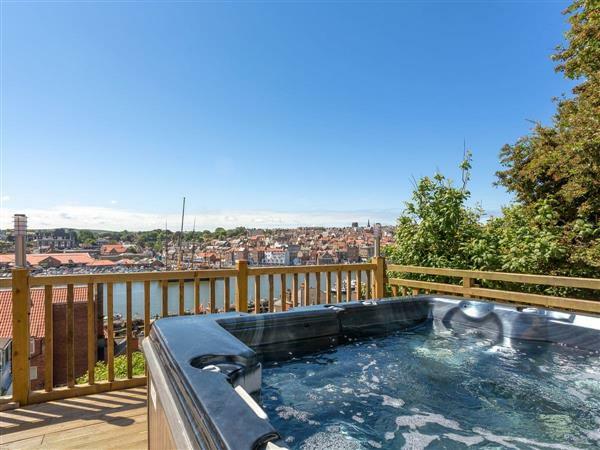 For the ultimate chill, there is a hot tub on the decking which has the most amazing views of the quaint fishing town of Whitby. For added comfort, there is a fully fitted kitchen and spacious living area, 42” Freesat Smart TV and USB sockets dotted around the apartment. Whitby is a historic coastal town and is the home of Whitby Abbey, which was made famous in Bram Stoker’s Dracula. The wonderful Goth Festival takes place twice a year. Keep an eye out for other festivals such as the Folk Festival, the Whitby Regatta and the Steam Punk Weekend. With many top class restaurants, olde worlde pubs and tea rooms, mixed with shopping streets set upon the cobbled back streets selling everything from goth clothing and jewellery to the world famous Whitby jet stone jewellery. The unspoilt fishing village of Staithes, just 10 miles away, nestles into the cliffs of the Heritage Coast and is just one of the nearby hidden beaches to explore. Other hidden gems include Runswick Bay, Saltburn-by-the-Sea and Robin Hood’s Bay, each has its own story of pirates and smuggling to tell. There is an abundance of walks and cycle tracks for ramblers and cyclists to take advantage of, including the Cleveland Way, as well as the Esk Valley and its stunning scenery, best enjoyed from the windows of the steam train that travels right into the heart of the North York Moors National Park from Whitby to Pickering. Other attractions for a day out include Beamish Museum, Lightwater Valley and Flamingo Land. The medieval walled city of York is just an hour away and is well worth a visit. After a day of exploring there is no better way to relax than a dip in the hot tub or a drink on the raised terrace over-looking stunning views of Whitby. You will find the beach 500 yards from Ropery Cottages in Whitby. With the shop 250 yards, and the pub & restaurant are 150 yards from Ropery Cottages. The Ropery can be booked together with Esk Cottage (ref UK2440 [Esk Cottage]) to sleep up to 8 people. The Ropery has 6 steps to the entrance. USB sockets in most rooms. Bedroom 1: With zip and link super king-size bed (can be twin beds on request) and en-suite with shower cubicle, toilet and heated towel rail. Bedroom 2: With king-size bed and en-suite with shower cubicle, toilet and heated towel rail. Living/dining room: With 50’’ Freesat Smart TV. Bathroom: With shower over corner bath, 2 steam shower cubicles, toilet and heated towel rail. Gas central heating, electricity, bed linen, towels and Wi-Fi included. Travel cot and highchair. Welcome pack. Enclosed garden with sitting-out area, garden furniture and barbeque. Hot tub for 7 (private). Private parking for 1 car. No smoking. Please note: There is a separate external entrance to the second floor and a sloping bank in the garden. Holidays at The Ropery, Ropery Cottages run from Friday to Friday. For a better idea of where Ropery Cottages - The Ropery is, you can see Ropery Cottages - The Ropery on the map below. Ropery Cottages - The Ropery is in North Yorkshire; should you be on the lookout for a special offer, you can find all the special offers in North Yorkshire. It's always worth checking to see what is on offer at the moment. Do you want to holiday near Ropery Cottages - The Ropery (UK2441), you can see other cottages within 25 miles of Ropery Cottages - The Ropery; have a look to find your perfect holiday location.